The Balkan Puzzle quilt block is a four patch block and is comprised solely of half square triangles. It is simple to construct and is a terrific block to use to make a dent in your fabric stash, as it looks great as a "scrappy" block. Just make sure to have light, medium and dark fabrics to showcase the different elements. 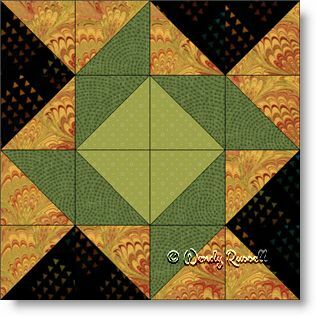 The two sample quilt illustrations shown give you ideas of what can be done with this block. Keep in mind though, that these sample layouts are just the "tip of the iceberg". You are only as limited as your imagination.